With more than 400 TV shows currently streaming or airing, the entertainment industry has plenty of opportunities to show abortion realistically—yet Hollywood still manages to come up short when talking about a procedure that nearly one in four women in the United States has before the age of 45. For the panel “Repro Writes: Abortion on TV Needs More Choices,” held at the WGAE in New York on April 12, Hollywood, Health & Society gathered guest speakers Dr. Willie Parker, author of Life’s Work: A Moral Argument for Choice; Kathleen Bedoya, executive producer of East Los High (Hulu); Gretchen Sisson, research sociologist, UC San Francisco; Amy Everitt, state director, NARAL Pro-Choice California / VP, special projects, NARAL Pro-Choice America; and Lizz Winstead, co-creator and former head writer of Comedy Central’s The Daily Show, and the founder of Lady Parts Justice network. Liz Flahive, co-showrunner for the Netflix series GLOW, joined the panel via video conference. Sisson, an investigator for the Abortion Onscreen program, which is part of a university research group called Advancing New Standards in Reproductive Health, said television still delivers the "well-trodden" stories when it comes to women ending pregnancies. "Most characters on TV obtaining abortions are white women," Sisson said, "when in reality the majority of women getting abortions are women of color. 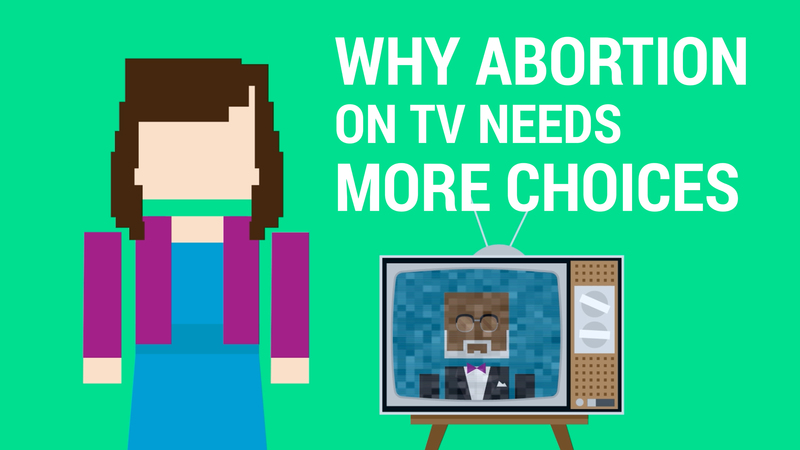 Teen-agers on TV proportionately account for twice as many abortions as their real-life counterparts,” and belies the fact that the majority of women getting abortions are older and already raising children. For GLOW, whose second season begins in June, the topic of abortion seems like a suitable story to tell. Set in the glitter-and-tights world of women's wrestling in Los Angeles in the 1980s, the show features 14 female characters. "Storywise, it was a very natural thing to do," Flahive said. "We’re a show about bodies, in a very big way, and making a choice about your body was something [we wanted] to tell very clearly and simply." In the episode “Maybe It’s All the Disco,” the lead character Ruth Wilder (played by Alison Brie) discovers she’s pregnant, from an affair with her best friend's husband, and has a no-drama abortion. “Not the right time. Not the right baby,” she tells a friend just before having the procedure. The absence of any emotional agonizing and hand-wringing on Ruth's part—the abortion is surprisingly "normalized" for a show set in the '80s—is a trend that Sisson sees building. "Such a bummer ... the worst abortion on TV," said Winstead, referring to the scene's hushed, dramatic tone. "Abortions are boring ... but the barriers are real. Don’t put [a character] in an ambulatory surgical center with a big [hairnet] on—you don’t need that." Yet the episode—which also included a storyline about legislation to defund Planned Parenthood—gets credit for boldly tackling politics and policy issues, along with reigniting the debate over abortion. One opinion weighed in about its depiction of a black woman getting an abortion "free of racist stereotypes." In a Hollywood Reporter interview, Shonda Rhimes, the show’s creator and executive producer, said the network didn’t want to include the scene, but Rhimes stood firm. Dr. Willie Parker talks about reconciling his Christian faith with his work as an abortion provider. "When you wrestle with your conscience and you lose, you actually win." Even though she reported a slight movement away from storytelling depicting heightened risk, Sisson said abortion on TV is still seen as very dangerous, with women suffering from a long list of serious and often life-threatening complications. "In real life [complications amount to] two percent," Sisson said. "And those are relatively minor (such as intense cramping)." The maternal death rate on TV is 7,000 times greater than real life, she added. “So if you need an abortion, don’t get one on TV,” Sisson said. As an abortion provider—one of the few remaining in Alabama—Dr. Parker said he's required to tell a woman that the procedure increases the risk for infertility and injury to her uterus, the exact same attendant risks when giving birth. His personal story is compelling. Raised in a Christian household in Birmingham (“the buckle of the Bible Belt"), Parker converted to an even more fundamentalist form of Christianity as a young man. Trained as an OB/GYN, he believed that his religious faith precluded any possibility of providing abortions to women. "I cruised along in my faith identity—this was before the rise of the so-called Moral Majority and the belief that abortion was murder," Parker said. "It was only after I became an OB-GYN that I had women asking me to end unwanted, unplanned or flawed pregnancies." One evening, he had his come-to-Jesus moment while listening to a tape of Dr. Martin Luther King Jr. talking about the time-worn Good Samaritan. But this time, Parker said, Dr. King flipped the parable's narrative, asking listeners to imagine what would happen to the victim, lying injured along the side of the road, if no one stopped to offer aid? Parker began to ask himself: What happens to my patients if access to an abortion is not available to them? “When you wrestle with your conscience and you lose, you actually win,” Parker said. "It became ethically and morally imperative to me as a women’s care provider that they have access to abortion services." Producer-writer Beau Willimon, president of the WGAE and a member of the HH&S advisory board, delivered opening remarks. HH&S is a non-profit program of the USC Annenberg Norman Lear Center that provides entertainment industry professionals with accurate and timely information for storylines on health, safety and security. For over 17 years, HH&S has served hundreds of shows across dozens of networks, cable and streaming channels. The Writers Guild of America union represents more than 15,000 film, TV, broadcast and news writers, with headquarters in Los Angeles and New York.